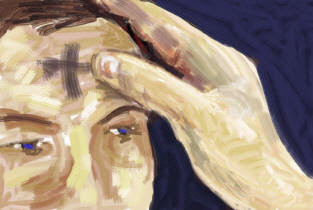 It's Ash Wednesday today. The beginning of Lent and its time to give something up before Easter. I am a Catholic by birth and upbringing but certainly not by dogmatic or doctrinated belief. However, this was always my favorite. It really became my favorite at college when I'd go to mass in Saratoga Springs at St. Clement's by myself. There was something poignant and earthy about the whole trip and ceremony and being among people on cool mid-winter school nights and thinking about the homes and warm ovens they went home to - it was all unknown to me, which made me love it and cherish it in all of its normalcy. I wrote a brooding story about it in one of my fiction workshops. I was always torturing people with brooding stories about young men who thought they might be artists in those days. I don't wonder why, but I do apologize to all those involved. I've improved only slightly. It's the beginning of lent and I'm spent. My sister took the dog from me to keep her company and we celebrated our own Fat Tuesday by going out to Mesa Coyocan on Graham Avenue. This has some of the best mexican food around and I stuffed my face and drank sangria before having to say goodbye to the dog. Nothing beats having him around. Anyway, this is another one of them in between posts. I've been writing a lot about the NBA lately and some people have seemed to enjoy it. This week a few trades have been going on and tomorrow there may be a few more, so I'll do a little wrap up of that and also discuss some of the labor issues that are boiling up in the NBA. I've been reading some of my favorite columnists about the NBA and they don't paint as rosy a picture as I do. For some reason and at some point I've become quite the optimist - I don't know when this happened. Trust me, I used to be quite negative. I've also been going college style and reading three books at one time so just be patient and I will regale you with my literary two cents. I'm also planning on turning my eye back to some short story writing which I haven't done in a long time. As those pop up, you can rest assure that you will see them up here. I've also been holding back on starting on my third novel idea, which has been brewing since I was in Spain back in the fall of 2007 and saw an interesting sight one night when I was walking around by myself. I'll explain all that at a later date and when I allow myself to give in to the story. For now, its holding back and letting the details and life elements wrap around the idea, which pushes it further and further from my immediate experience and allows me to write about it more objectively, more artfully. Finally, I am still trying to think of the next album or band to discuss. I was listening to "Moonlight Mile" by the Stones tonight and was thinking about throwing my hat in that ring. I'd also like to do something a little more contemporary. Maybe a rundown of the Walkmen's last album "You & Me" in preparation for their new album coming out in the spring? Maybe something from the classics again, something that makes me feel desperate? Throw out any ideas. As always on Puddles of Myself, the conversation is riveting and self-centered and the content is always new. Concurrently, enjoy the Winter Olympics - Vancouver has never turned its back on you and they always serve a stiff drink with a smile. Now, the next installment of From Here to the Last Mound of Dirt. That’s my favorite picture of mom. I sit next to James and keep my eye on it. I just think she looks so young in it, so glamorous. A lot of that has to do with the fact that it’s in black and white. It’s romantic, its like one of those old snapshots they show of Bob Dylan from when he was in New York. Liza sighed and looked down at her black skirt. Then, like a swan, she pulled it up and leant forward. Her hands became limp and fell between her thighs. She considered the casket. It was raised on a small platform, which was the same hideous color as the red carpet in the rest of the home. She couldn’t say that the casket was ugly, because in some way it was beautiful. The wood looked like a finely finished wood floor in Better Homes and Gardens, it was a brown that didn’t have a good name to describe its brownness. It reflected the light nicely – Liza could see the reflections of her family sitting in a row. Tom, Ben, Her, James, Eve, Maggie. Their forms were shadowy and smushed in the coffin’s smooth corner reflection. I heard they call it a wake because originally the family and townspeople who gathered to mourn hoped that the body would wake up and come back to life. I can see the profile of mom’s face peeking up above the edge. It rests on a satiny pillow. She never slept like that. Liza continued to regard her mother’s still form. Then she turned over to the more recent picture of Rose. She’d taken that picture. It was to be for a school project, but she never decided to use it – she never thought it was any good. But as she looked at it now, it seemed that it might be a good picture after all. For some reason, feeling stuffy in a black blouse and skirt, and unable to look anyone in the eye, the picture now seemed to sum up her mother perfectly. Liza focused back on her still mother. She wondered if maybe Rose was thinking of her at that moment. It was never like her to think of the soul and of afterlife – she certainly didn’t care much about heaven or hell – but maybe part of her mother could still think, and if she could still think maybe she was thinking that Liza had let her down. However, Liza hadn’t let her down, she’d only lived her life. That knowledge, that piece of truth and acceptance, didn’t make the understanding any better, it didn’t ease the loss. Liza recognized a few of the people who were kneeling on the pew in front of her mother’s body. “Who’s that again?” She asked her father. Liza looked at the family paying their respects. It was a simple family: mother, father, a sister and a brother who both looked about fifteen or sixteen. She felt her father squeeze her arm tenderly. I look at dad. He doesn’t seem sad, he’s loose, he’s just looking up there at mom. Did he even see Uncle Connor? I wonder if I will ever have the same thoughts he’s having right now, whatever they may be. I look back down at my skirt. I try not to wear black too much, but I forgot how comfortable this skirt was. I was supposed to be planning outfits for the weekend nights out – but now here we are. Dad’s reaching into his coat. Is he? No, he can’t. Ben took a good pull of his flask. His lips felt puckered, but only because he couldn’t bear to bring them to a smile or a frown. “Dad,” Tom said from the other said. Ben looked at his son. Tom’s face appeared tight, his cheekbones stuck out strongly. My son, my strange son. His voice had a weight in it. It could’ve been the weight of someone who was almost in one of the pine boxes that Rose was laying in. Or, if the body had been lost in that cold winter water, it could’ve just been an empty coffin with rocks approximating his weight. Although he was sitting in front of his wife’s dead body, the lifeless form that still carried so much life for him – more than fifty years worth – what made Ben’s heart lose its humor, lose its guard, was his son’s strange face and voice. The fact that he tried to kill himself. In a house where nothing was sacred, there were two things that were sacred: Rose and Tom’s attempt at suicide. My son my strange and smart son. Ben smiled. He put his arms around Tom and Liza. He hoped he didn’t look too pleased.